Japan made history when the defeated South Africa, former World Cup winners and one of the top 4 favourites to win the competition this year, in what was a special game. japan secured the win in last moments of the game scoring a last ditch try and made the scoreline 34-32 and stunned everyone. 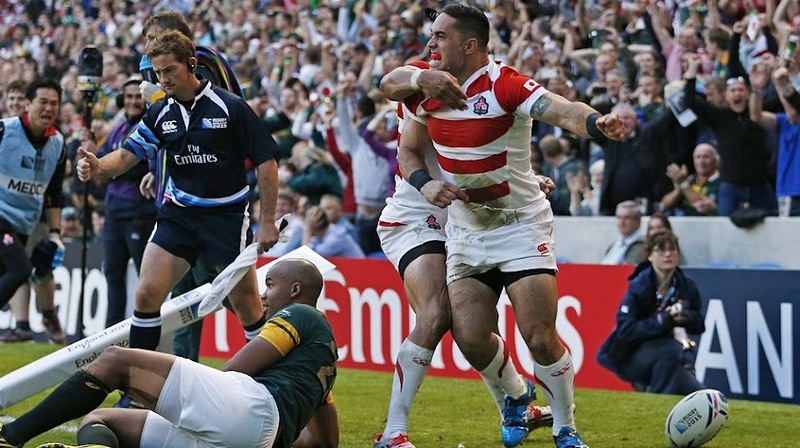 Springboks were stunned by 40-1 odds Japan side who came from behind and won a very narrow match scoring a try in dying moments of the game. It was the first game for both sides and South Africans were heavy favourites for this game and rightly so looking at both teams rankings. But when Japan secured a scrum 5 yard away in the last minutes you could sense something special is about to happen and that exactly what happended when whole stadium erupt in joy even the neutrals when Jaoan Karne Hesketh scored a try in last moments of the game to overtake South Africa score and win their first game of the 2015 Rugby World Cup. We will have the extended match highlights of Japan vs SpringBoks match right here plus full match replay download links in a while please check back in short time to get the match footage of what was a hugely memorable encounter, the best so far in the world cup. Goromaru was Japan’s man of the match after scoring one try, two conversions and 5 penalties and lead the team superbly to what is the biggest achievement in Japan rugby history.